TRACI WILSON is the 2018 recipient of the Irene Ferguson Marine Wife Recognition Award. Traci stands as an inspiration to all because of her unwavering commitment to her Marine husband and five children, her local community, and to her fellow Marine Corps families. Traci is a mentor to many, a friend to all and a leader among her Marine wife peers. As a Marine Wife, Traci has established herself as a key participant in the Family Readiness Programs of her husband’s current (and former) units. She readily volunteers to support the unit in any capacity, and works to ensure success of the Family Readiness Officer’s outreach efforts. Traci has also demonstrated her passion for education, particularly on the educational needs of military families, by serving in various leadership positions with her local PTA/PTO organizations. Traci also offers her time and talents to military support organizations including the National Military Family Association and Operation Purple Heart Family Retreats. Military families all around the globe receive needed support and assistance because of Traci Wilson’s commitment and hard work. 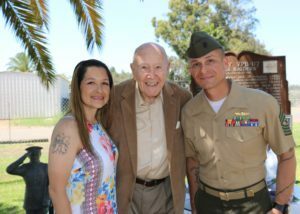 The Flying Leatherneck Historical Foundation salutes Traci Wilson for her leadership in education, her advocacy for the less fortunate in the community and her volunteer efforts in support of Marine Corps families. Traci’s zest for life and passion for service to others is a credit to her family, her community and to the Marine Corps.